Yesterday was our first trial back since New Years Eve. People kept asking if Loki was entered but no, not yet. I hadn’t entered anything up to this point because Lu is pretty unhappy if the temperature is mildly warm so anything in January, Feb or March is usually pretty risky in Australia! I decided after that first run that I really just wanted a pass in Novice so I could get out of there as it was the last pass we needed. I don’t care if we’re in Excellent for a while. It’s usually nice there- not too hard but with some challenges, and the class sizes are small. So in her novice run I just got her to trot calmly over the DW cos I knew for sure she’d just trot all the way down and sure enough we got a pass (and won the ring, ha). Interestingly, even though she’d RUN that dogwalk earlier in the day, she got to the top plank & started to freak out, convinced she was going to die. Gaaaaahhhhhhh. I guess she had more time to think about the height when she wasn’t running. 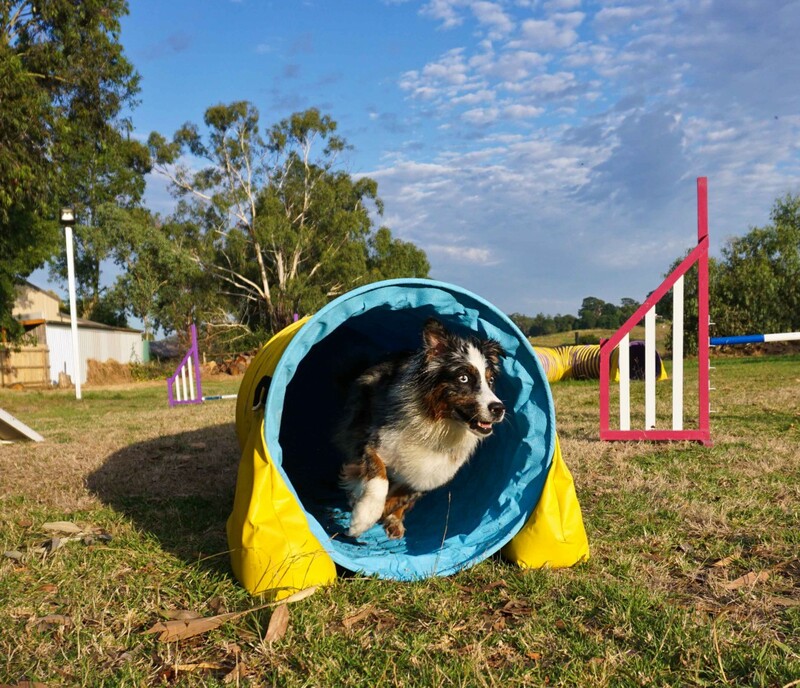 Nic also made his agility debut and actually ended up running 3 rings with Lu! He did both Excellent jumping rings and managed to pass them both & come 3rd despite making it very obvious that I need to teach him emergency rear-crosses. And he ran my last novice agility cos I’d already passed the other one. He was doing awesome until he got out of position after the table. I’m looking forward to ‘handing her over’ to him when Loki starts competing. In the meantime it’s a nice way to ease them both in to working together. Lu must have been very tired when we got home as she was randomly getting angry at the other 2. When we went to bed, she positioned herself so that if Mal wanted to go to one of the other beds he had to go past her. A lip curl & intense stare from her when he tried was enough to freak him right out and he ended up hiding on our bed. Dunno what she was getting possessive over- her space I guess. Just shows how tired she was! Lu has bad dogwalks in competitions. More strides, not full-speed running, no separation at the end and I’m lucky if a back toe gets in the contact zone. NOT the kind of contacts I want. This weekend we hit 0/3 nicely. The judges let 2 of them be ‘in’ and I told her she was good for those 2 but they weren’t, really. Maybe confidence in different locations/trial environment? I don’t think the arousal level is a factor because when we play the crazy balls game she’s super excited and fast but still hits. So maybe confidence at being on unfamiliar dogwalks? That should be solved easily enough: just do more dogwalks. Enter ‘not for competition’ runs with her and bring in a toy to play with if she hits them… Do a loop and put her on again if she doesn’t. Enter ‘gamblers’ runs and just do loops with the dogwalk involved. One other factor is that all 3 of the exits this weekend were to the side. 2 of them were into empty space then turn (which we’ve worked on a little bit at home) and the other was to a bar about 7-8 meters ahead but In fact you wanted to pull her to the left & do the broad. Ok, so then maybe running into empty space is also a problem. I can fix that too- just go to a thrown ball into the empty space to get her in the habit of just running forward. I suppose I could do the same thing with discriminations, sometimes throw ahead, sometimes pull to the side and throw. I just really wanted to be a bit of a running-contact pioneer, y’know, but she makes it look so dodgy and untrained at a trial!! !